For the weeks of March 16-31, Catoosa and Walker County restaurants/hotels earned a combined ten 100 scores. There were no failing restaurants/hotels in either county. Local elementary schools had a good showing, with each school inspected scoring a 100. Inspector notes: Observed ice machine on the 3rd floor that was not clean at a frequency to prevent build-up. Observed the shower in room 307 was not cleaned after previous occupant and prior to be provided to the next occupant. Observed the floor of the 3rdfloor hallway, as well as the stairwell floor between floors 3 & 4 on the left of the hotel, and the floor of the guest laundry room was not maintained clean. Inspector notes: Observed no thermometers inside of some of the prep and reach-in coolers. Coolers should have an accurate, working, thermometer located in the warmest part of the cooler. Inspector notes: Observed potato slicer (for fries) mounted on the wall, not being cleaned every 4 hours. Observed bucket of chemical sanitizing solution stored in direct contact with bottles of condiments and clean dishes. Inspector notes: Observed carpet in stairwells and hallways not clean. Observed sitting chairs in rooms 124 and 307 stained, deck chairs in several rooms not in good repair, refrigerator in room 212 not clean, bench in room 212 not in good repair, and microwave in room 315 not clean. left inside the microwave of room 303 from the previous occupant and before the room was listed as available for use. Lampshade in room 204 was not clean and signs of water damage. The refrigerator in room 108 was not cleaned after the previous occupant and before being listed as available for use. Inspector notes: Observed tub not in good repair in room 212 and tub not clean and the faucet leaking in room 107. Also observed missing toilet bolt covers in rooms 107, 118, 211, and 212. Exterior door in stairwell on left side of building not protected against the intrusion of pest (light visible around door). Observed the wall needs to be painted and ceiling needs to be repaired and painted in room 212, the ceiling in 211 needs to be repaired. Inspection notes: Observed inside top of microwaves not clean to sight or touch. Inspection notes: Observed employee eating in the kitchen and drinking out of a water bottle instead of a single service cup with a lid and a straw. Observed time/temperature control for safety (TCS) foods cold held at greater than 41 degrees Fahrenheit in the double door glass Coke cooler. Observed PIC preparing and handling food in the kitchen without wearing a hair restraint. Inspector notes: Observed the concentration of sanitizer solution for ware washing and food prep surface well above the allowed maximum concentration for bleach solution. The testing strips read the solution well over 150ppm for bleach. The strips turned black during testing. Observed wet sanitizing wiping cloths outside of sanitization solution container on service line. Inspector notes: Observed ice machine dispenser chute not being cleaned at a frequency to be maintained clean to sight and touch. Observed in rooms 111 & 207 that the shower head cover on the wall needs to be sealed in place and also observed water damage in room 111 around the top of the tub. Observed daylight from outside the door of room 201. Observed the HVAC filter in room 207 with a tear in it and in room 156 the HVAC filter had an accumulation of dust. Observed lamp shade by window in room 111 not in good repair. Also in room 111 the hairdryer was not in working condition, the microwave was not being maintained clean in room 111 & 201, the coffee maker in room 156 had an accumulation of dust. Observed the bed covering in room 111 had multiple holes and tears in it. Observed the electrical outlet in room 207 was in need of repair. Inspector notes: Observed broken hand soap dispenser at hand washing sink. No soap was able to be dispensed. Observed no handwashing sign in the women's restroom. Observed several cracked and severely scalded plastic containers. Observed heavy food accumulation under shelves in reachin coolers. Observed improper plumbing of hot and cold water at hand washing sink in the kitchen. No hot water was available at hand sink, unless the water at the three compartment sink was also turned on or in use. There is no way to regulate water temperature at hand washing sink. Water is either cold or scalding hot. Inspector notes: Observed food employee handle RTE food with bare hands. Employee prepared a soft taco without wearing a glove on the hand he was holding the taco with as he was stuffing the taco. Observed employee preparing food while wearing a bracelet. Observed vegetable washing sink being used for straining silverware. Bucket used for straining the silverware with food debris was inside of the vegetable washing sink. Inspector notes: Observed gravy in walk-in cooler at 90 degrees Fahrenheit that was covered with a lid that had been cooling for over 3 hours. Observed several pans of sausage cooling in small reach-in cooler stored in Styrofoam boxes with closed lids stacked on top of each other. The sausage was at 50 degrees and had been cooling for 2.5 hours according to PIC. Observed excess grease on the outside of the grease trap and all over the concrete pad. Inspector notes: Observed prep cooler not cold holding at 41 degrees Fahrenheit or below. Internal thermometer was reading 60 degrees Fahrenheit. TCS foods inside of the prep cooler (top and bottom) ranged in temperature from 47-63 degrees Fahrenheit. Inspector notes: Observed an employee beverage not in a single use cup with a lid and straw. Observed made in house sauces being stored without a label containing the common name. Observed sauces in walk-in cooler being stored on the floor of the walk-in cooler. Inspector notes: Observed toilet bolt covers missing in the rooms 151 and 260. Observed missing light covers in the bathrooms of rooms 101 and 260. Inspector notes: Observed raw animal foods not properly separated from each other in holding unit/during preparation. Observed container of Raw Quail on top of a container of raw ground beef. Observed concentration of chlorine in the sanitizer bucket over 200 ppm. Observed cook with beard longer than 1/2 inch not wearing a beard restraint. Inspector notes: Observed several personal drinks in bottles and cans in the facility. Observed drying racks and pizza oven with build up. Observed build up around the floor/wall intercept. Inspector notes: Observed multiple roaches in one room on the lower level. Observed the refrigerator in one room turned off for quite a while, causing mold/mildew to begin to grow and develop. Inspector notes: Observed oven door hinge damaged. Inspector notes: Observed employee agreement not up to date. Restaurant report compiled by reporter Carrie Chandler. A: Food safety excellence with a numerical score of 90 to 100. B: satisfactory compliance with a numerical score of 80 to 89. C: Marginal compliance with a numerical score of 70 to 79. U: unsatisfactory compliance with a numerical score of 69 or less. The Ringgold City Council voted to nix a proposed "entertainment district" on March 25. The ordinance would have allowed the public to carry open alcohol containers downtown while shopping or attending events. From left: Mayor Pro Tem Terry Crawford and Councilman Kelly Bomar. Discussion about a potential open container "entertainment district" ordinance in Ringgold turned into an actual vote Monday night, March 25, when the majority of the City Council shot down the idea amid passionate opposition from residents. In late 2018, Councilman Kelly Bomar brought up the idea of such a district downtown as a way to help local businesses and even bring more restaurants and businesses to town. The open container, or entertainment district, would allow patrons to drink an alcoholic beverage at a restaurant's outside table, or purchase a beverage and then carry it with them downtown as they shop or attend events. Several members of the community spoke out in opposition against the idea, many of whom said they feared it would impact young people and create more crime in town. "It doesn't affect you once it leaves this room, but it affects me, my fellow pastors, and the fellow churches," said local pastor Clyde Painter. "I'd like for it to be not tabled, but to be taken off the agenda completely and never brought up again because it's a snake that's going to rise up and bite." Resident Tony Hullender concurred with Painter, claiming alcohol changes people and would impact those who live close to downtown. "I like to be in control of my body and I like to be in control of what I do at all times," Hullender said. "Alcohol makes you do things you're not supposed to do. I've seen too many lives ruined because of alcohol." Hullender also claimed it would be very easy for someone of age to purchase an alcoholic beverage and then walk out of the establishment and hand it off to a minor. "I take my grandkids down to the restaurants to eat and everything and I don't want my grand kids subjected to alcohol on the streets," Hullender said. Finally, Hullender added that he didn't want downtown Ringgold to turn into Bourbon Street in New Orleans or the Las Vegas strip. While several residents said that allowing such a district could influence young people and cause problems, it was also speculated that the ordinance could lead to more loitering, panhandling, or even prostitution downtown. Amid the overwhelming opposition, Andrew Stone, owner of The Dapper Gentleman shop on Depot Street, was the lone supporter who spoke out in favor of the district. "I'm very much in favor of the entertainment district because I know that the customers that I've talked to, the residents I've talked to and the other small business owners that I've talked to know what this could do as far as attracting more people into the downtown area and would be a boon to our businesses," Stone said. Stone said that people drink regardless of whether they're permitted to walk around downtown with containers. "It wasn't because someone was able to leave a restaurant with a drink that my grandfather was an alcoholic. He was going to find the alcohol no matter where he was," Stone said. "It's not like we're introducing alcohol into the city. We're simply making it available for people to leave the premises of somewhere and maybe walk to a business and shop." After the comments from the public, Councilman Kelly Bomar defended his thought process in proposing the ordinance. "Nothing's being voting on tonight," Bomar said. "The purpose of tonight was to do exactly what it did — get a conversation started and help us better understand where the pulse of things is." Bomar said he initially had the same concerns as some residents, but that after researching such ordinances, he concluded that a lot of the concerns don't seem to come to fruition. "What I came to find out is that a lot of the bad things that would happen... the facts simply don't bear it out," Bomar said. "Underage drinking is illegal. If they do it with an open container, closed container, at somebody's house ... it's still illegal. Loitering in the city of Ringgold is still illegal, panhandling is illegal, prostitution is illegal ... all the things you think are going to come in are illegal. There's no greater propensity for those things to happen because I have a glass of wine on the back porch of Pepper's or inside." Bomar said he initiated discussions in December because he thought the district could be a tool for generating more revenue for current businesses and for potentially bringing more businesses to Ringgold. After the long discussion, Mayor Pro Tem Terry Crawford took a stance on the issue and motioned for a vote. "I've had phone calls at home and I've had people that have told me; 'we don't want this and we don't need this'," Crawford said. "I'm going to go one step further and I'm going to make a motion that we vote this no and be done with it. You've got to take a stand somewhere and this is mine." Councilman Larry Black supported Crawford's claim that the general public of Ringgold are against a potential district. "I think it's rather clear from the people that came out tonight, the people of Ringgold, the people that are here tonight are very much against this ordinance or issue moving forward," Black said. Councilman Randall Franks said a lot of his concern would revolve around a place like Caffeine Addicts, which is known as a hangout for teens after school. "I see this as just another invitation to create more opportunities for more problems," Franks said. Ultimately, Crawford's motion to squash the issue was approved 3-1, with Bomar the lone holdout and Councilwoman Sara Clark absent from the meeting. The day after the vote, March 26, Bomar published a blog post stating he felt blindsided by a vote being taken on an issue that was simply supposed to be a discussion for a potential ordinance. "Remember, nothing was up for a vote last night, nothing," Bomar wrote. "Not even close to being to a vote. This was for discussion and information gathering. I knew there would be vocal opposition, what I didn't expect was a blindsided attempt to hijack the issue." Adam Cook is a general assignment reporter and covers the Walker-Catoosa County area. He has been a reporter since 2009. "Underage drinking is illegal. If they do it with an open container, closed container, at somebody's house ... it's still illegal. Loitering in the city of Ringgold is still illegal, panhandling is illegal, prostitution is illegal ... all the things you think are going to come in are illegal. There's no greater propensity for those things to happen because i have a glass of wine on the back porch of Pepper's or inside. "It doesn't affect you once it leaves this room, but it affects me, my fellow pastors, and the fellow churches. I'd like for it to be not tabled, but to be taken off the agenda completely and never brought up again because it's a snake that's going to rise up and bite. "I think it's rather clear from the people that came out tonight, the people of Ringgold, the people that are here tonight are very much against this ordinance or issue moving forward. • The center is a shelter for domestic violence victims in Walker, Catoosa, Dade and Chattooga counties. Community members put on their acting shoes on Saturday night, March 30, as part of the annual mystery dinner comedy show fundraiser produced by the Family Crisis Center of Walker, Dade, Chattooga & Catoosa Counties. From left; Catoosa County Coroner Vanita Hullender as Cher, Ringgold maintenance man Dexter Coley as Elton John, and Fort Oglethorpe City Council lady Paula Stinnett as Vanna White. Shanda Reese (left) and Ringgold Mayor Nick Millwood partied all night as the iconic duo from "Wayne's World." Walker County Sheriff Steve Wilson was a huge hit during the show with his portrayal of the famous "Church Lady" from Saturday Night Live. Walker County Superintendent Damon Raines (left) was a huge hit with his Urkel-esque nerdy character alongside Coroner Vanita Hullender as Cher. 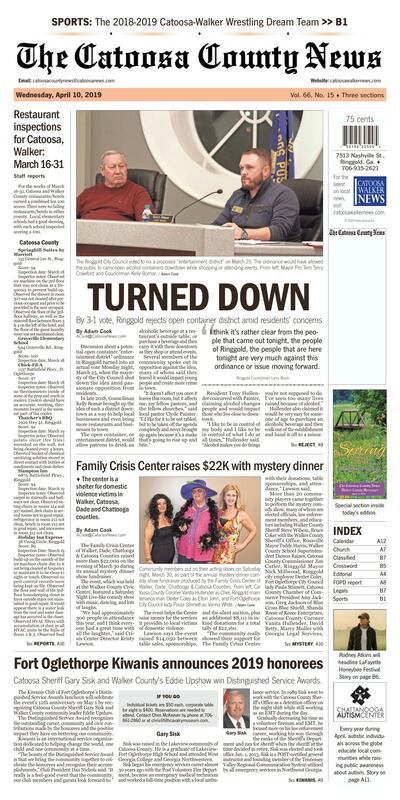 The Family Crisis Center of Walker, Dade, Chattooga & Catoosa Counties raised more than $22,000 on the evening of March 30 during its annual mystery dinner show fundraiser. The event, which was held at the Walker County Civic Center, featured a Saturday Night Live-like comedy show with music, dancing, and lots of laughs. "We had approximately 300 people in attendance this year, and I think everyone had a great time with all the laughter," said Crisis Center Director Kristy Lawson. The event helps the Center raise money for the services it provides to local victims of domestic violence. Lawson says the event raised $14,050 between table sales, sponsorships, and the silent auction, plus an additional $8,111 in in-kind donations for a total tally of $22,160. "The community really showed their support for The Family Crisis Center with their donations, table sponsorships, and attendance," Lawson said. Sarah Morris with Bowers and Gibson, Walker County Probate Judge Christy Anderson, Lookout Mountain Judicial Circuit Supreme Court Judge Brian House, LaFayette Mayor Andy Arnold, Richard Marable with McDonald's community relations, and DJ Bobby Daniels with J103. Lawson said October is Domestic Violence Awareness Month, which means the Family Crisis Center will plan events for that month that could include a 5K race, and the Center's annual Tea and Trends Fashion Show. "Of course, we look forward to our mystery dinner show event each year and can't wait to start planning for March 2020," Lawson said. "It just amazes me how the community comes together and shows their support for this organization." Catoosa Sheriff Gary Sisk and Walker County's Eddie Upshaw win Distinguished Service Awards. The Kiwanis Club of Fort Oglethorpe's Distinguished Service Awards luncheon will celebrate the event's 12th anniversary on May 1 by recognizing Catoosa County Sheriff Gary Sisk and Walker County community leader Eddie Upshaw. The Distinguished Service Award recognizes the outstanding career, community and civic contributions made by the honorees and the positive impact they have on bettering our community. Kiwanis is an international service organization dedicated to helping change the world, one child and one community at a time. "The beauty of the Distinguished Service Award is that we bring the community together to celebrate the honorees and recognize their accomplishments," Club President Dan Nichols said. "It really is a feel-good event that the community, our club members and guests look forward to." Sisk was raised in the Lakeview community of Catoosa County. He is a graduate of Lakeview-Fort Oglethorpe High School and attended West Georgia College and Georgia Northwestern. Sisk began his emergency services career almost 30 years ago with the Post Volunteer Fire Department, became an emergency medical technician and worked a full-time position with a local ambulance service. In 1989 Sisk went to work with the Catoosa County Sheriff's Office as a detention officer on the night shift while still working as an EMT during the day. Gradually decreasing his time as a volunteer fireman and EMT, he focused more on his law enforcement career, working his way through the ranks of the Sheriff's Department and ran for sheriff when the sheriff at the time decided to retire. Sisk was elected and took office Jan. 1, 2013. Sisk is a POST-certified general instructor and founding member of the Tennessee Valley Regional Communication System utilized by all emergency services in Northwest Georgia. Since becoming sheriff, he has focused on rehabilitation while remaining aggressive with crime prevention and apprehension. Sisk partnered with Georgia Northwestern and started the first GED program in the jail and has brought in other organizations such as Narcotics Anonymous, Alcoholics Anonymous, The Transformation Project and Project Change. Sisk believes that investments in young children's lives are imperative to facilitate a better future for all. This is evident by the number of community service organizations Sisk is active with and that most serve children. Sisk and his wife Meredith have been married for 25 years and have two daughters, 17-year-old Jessica and 10-year-old Madison. Upshaw was born and raised in the Kensington, Ga., community, graduating from Chattanooga Valley High School where he played football, basketball and ran track. He graduated from Chattanooga State College, where he received his associates degree in civil engineer. He worked in his family's construction business and while under contract with North Georgia Electric Membership Corporation (NGEMC) was offered a job as a heavy equipment operator by Jim Young. The pay was better as a lineman, so he changed careers and worked his way up through the ranks to become a supervisor. Upshaw led many NGEMC crews out of town to respond to disasters such as Hurricane Hu-go and Katrina. He retired after 42 years of service as a service lineman and trouble shooter supervisor at NGEMC. Upshaw grew up in and has always attended Pleasant Grove Baptist Church, currently serving as a trustee. His love for his church can be seen in his everyday life and dedication to community service. He's a member of the Chickamauga Lions Club where he served as president 10 times and zone chair. His community service includes serving as a founding member for Habitat for Humanity, North Georgia YMCA, Family Crisis Center and the Cottage. His interest in community health and economic development led him to volunteer for several organizations including Georgia Public Health Association, Lookout Mountain Community Services and Walker County Chamber of Commerce. Upshaw has been recognized as Walker County Citizen of the Year, Walker County Patriot Citizen of the Year, YMCA Volunteer of the Year and Chickamauga Lions Club Member of the Year. Happily married to Debby for 40 years, they live in Chickamauga and are the proud parents of Katie and Conner. The distinguished service award luncheon conducts a silent auction with each honoree selecting their favorite charity to receive 50% of the funds raised by the donated items. sisk has selected the link at the "y" and upshaw has selected north Georgia yMCa Backpack Blessings as their silent auction beneficiary. along with recognizing the honorees and raising money for their selected charity and numerous Kiwanis programs, the luncheon allows the club to showcase the international service mission of Kiwanis international and the local programs and projects that are sponsored by the club. Individual tickets are $50 each, corporate table for eight is $400. Reservations are needed to attend. Contact Chris McKeever by phone at 706-861-2860 or at chris@6thcavalrymuseum.com.